This pen is the apotheosis of Hero’s emulation of Parker “51”, having the most possible in common with that storied pen without being an out and out clone of the original. This statement is more true now than in the past, as there has been a change in the cap, which occurred at least as early as 2006, away from a much clone-ier version of the arrow clip (as can be seen yet in the 616, or in this rather good article by someone else). 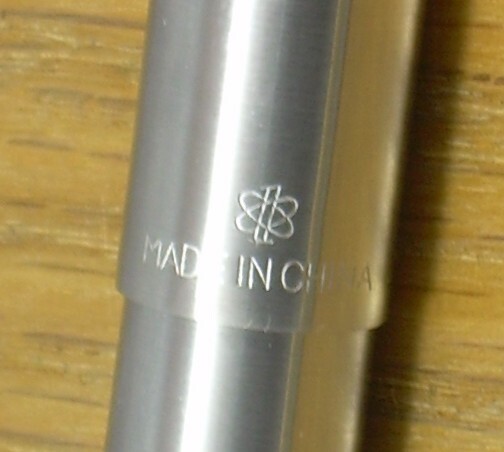 The new version of the cap involves a spring-loaded clip, very similar to the sort of thing Sheaffer has used since the 1940s. Earlier versions also had an ink-window of sorts at the “clutch ring”, in the same manner as the 616, and a rounded tail as all but the very earliest “51”s had; the new ones have a double-jewel effect, which is attractive enough but either a throwback or a nod to the Parker 61. Functionally, I’m impressed by the 100. It is very hard to tell the difference between using the example I own and one of the Parkers, a statement which I’m sure will have me branded an apostate by the Parker Inquisition and put to the trial of the soft cushion. I may also find myself in possession of “a good one”, since there are some concerns about Hero’s general quality control. 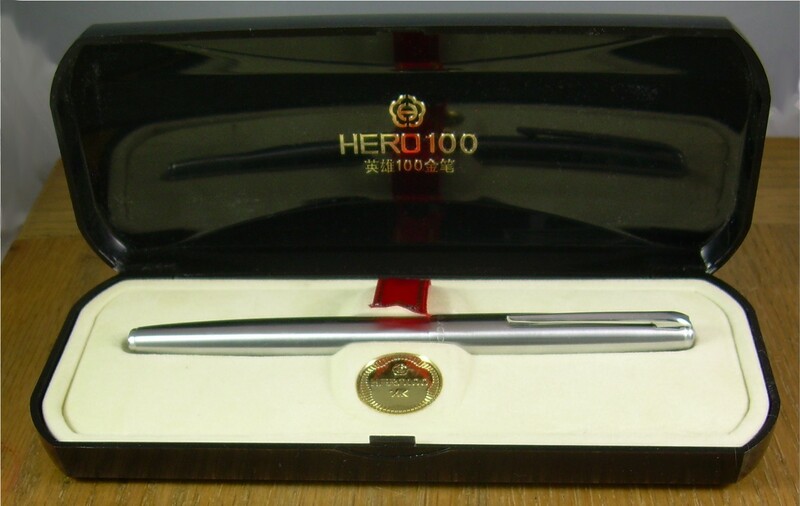 However, I will still say that for someone interested in trying a Parker “51” but hesistant at the cost, spending somewhat less than half what one could on a merely functional Parker to buy a Hero 100 will give a very clear idea whether it’s a quarry worth pursuing. To moderate the praise, I will remark further that the filler on the 100 is, while not the pathetic object it is on some Hero models, not altogether great. There is a certain want of finish on the edge of the cap and, in the case of the steel-bodied version, the barrel; they’re not positively rough, but there is an intimation of roughness absent on Parkers. In my pen, the cap’s grabbing mechanism, a set of steel fingers rather more like that in a Parker 45 than the “51”s clutch (a set-up the later versions of “51” also adopted), make a terrible grating when the cap is posted for writing. There’s no marks (yet), but I can’t help wondering if barrel defence is the reason behind the tail jewel. 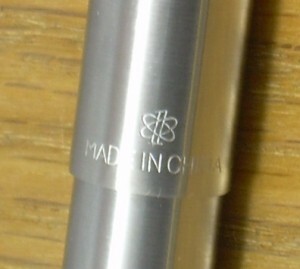 Those intent on dismantling this pen should be aware that, at least in the newer versions, the internal anatomy is quite different from the Parker “51”. The sac protector must be unscrewed from the back of the section, and the collector/feed/point assembly also unscrew once the protector is out of the way. I am aware of this not from grim experience, but from having seen a little tool intended for the latter for sale online. I suspect a piece of square cross-sectioned steel or brass tubing would serve, but as I’ve not been forced to try I haven’t any dimensions to suggest. Production Run: I have no idea how long the model has been in production, and it may have been since Hero’s inception at the end of the 1940s. It is still being made, and is a foundation if not a flagship of Hero’s line. Cost When New: Depending on where you get it, $30.00 to $40.00 if you take shipping into account. Size: 14.1 cm long capped, 15.2 cm posted, 12.6 cm uncapped. Body: Plastic of some sort (likely polystyrene), which is clad with stainless steel in some variants. It comes in a nice box; that ribbon lifts the pad to allow access to some relatively comprehensible instructions. The box is reasonably splendid when closed, too. This little Atomic 1 seems to be a new thing for Hero.